The structure of taxes and fiscal contracts between host countries and foreign companies has major implications for the success of oil development projects. This is because of several key characteristics of such projects: large investment outlays, long lead times to project completion, and long periods of project output and payout. These characteristics usually are coupled with an incomplete sharing of information and technology, and significant differences in the ability of the various parties to bear the risks involved. These characteristics often lead to unstable contracts and, in many cases, to the failure to develop projects that are economically attractive in aggregate terms but unattractive to one or both parties because of uncertainties over sharing project risks and returns. The average service life of fixed assets in U.S. manufacturing industries increased gradually from 1962 to 1969. Thereafter, it fell sharply up to the mid-1970s. The most rapid change occurred in the three years following the Arab oil embargo. There is reason to believe that these events were causally related: the rapid escalation of petroleum prices caused the decline in useful lives of plant and machinery. The reasoning behind this statement and an analysis of the data on service lives of fixed assets are the topic of this paper. Energy forecasting is a hazardous occupation. Virtually any pro-jection is doomed to be incorrect. Opinions can swing from one extreme to another during a six-month period. Our paper is not intended to providestill another projection, but rather to try to explain why different individuals and organizations arrive at divergent views on the long-term energy outlook-and therefore differ on policy decisions. One of the many significant impacts of silicon-chip technology is the ability to do detailed engineering-based microeconomic simulations of industrial behavior under variations in input and output prices, tax schemes, and technological choice. If the number of plants in an industry is manageable and each plant can be parameterized by a manageable number of coefficients, each plant's response to such variations can be computed individually. Consistent aggregation produces industry-wide results, together with impacts on output and factor demands. Furthermore, cost-benefit analysis of possible new plants or technologies is made far more flexible, as the implications of possible future price or tax environments can be easily computed. As a result of substantial increases in oil- and gas-supply prices (and despite recent softening of these prices), selected uses of geothermal energy have become competitive with conventional fuels. Geothermal energy includes resources with a wide range of temperatures. These resources are suitable for numerous applications from low-temperature heating to the production of high-temperature steam for use in generating electricity. The Congress of the United States enacted the Energy Conservation and Production Act in 1976. It was amended in 1977. Title III of this act is designed to implement policies to curtail energy demand associated with new buildings; Title IV is aimed at establishing policies to encourage energy conservation in existing buildings. The main purposes of both Titles are to curtail energy consumption on the part of households as well as commercial buildings. The purpose of this paper is to analyze the effectiveness of various policies, which may be followed by the government under this Act, for curtailing the energy use by the households. Although no comprehensive energy policy to meet this goal has yet been formulated, the purpose of the Act gives a clear indication about the type of policy that could eventually emerge. 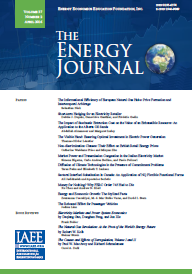 My intention is not only to examine the effectiveness of the policy or policies emerging from the above Titles, but also to compare them with alternate, albeit traditional, policies of pricing, taxes, and subsidies aimed to reduce energy demand. A standard result from static economic theory is that a monopolist with zero cost will maximize profits by charging the price at which the demand has unit elasticity. Yet, the demand for petroleum, as seen by consumers, is price inelastic, and empirical estimates of the price elasticity for petroleum are typically less than one. Given the relatively low production cost for Middle East oil and the optimization rule referred to above, a natural question is whether OPEC, acting as a monopoly, has exhausted its potential for forcing price increases or whether it will ultimately be able to charge still higher prices as it tries to optimize its earnings. This possibility of higher oil prices is important for OPEC and for oil-consuming countries-for OPEC because the finite nature of resources implies that excess production today represents an irrecoverable loss; for consuming countries because of the high cost of oil and the adverse consequences of still higher oil prices on inflation and unemployment. U.S. Gasoline Demand: What Next? Predicting the demand for motor gasoline over the last ten years has proven a most frustrating experience. Up until 1973, industry analysts felt considerable assurance in applying historical growth rates that averaged approximately 5 percent per year. Who in 1973 would have predicted that gasoline consumption in 1981 would fall below 1973 levels? For example, in 1973, Shell Oil Company predicted annual growth of 4.9 percent per year. Their forecasted value for the year 1981 exceeded the actual level by 42.7 percent (Shell, 1973). Unfortunately, errors of this magnitude are not as benign as predicting the point spread in a pro football game. To the contrary, both private and public policy decisions depend on the accuracy of such forecasts. Because of the importance of gasoline as the major refinery product, refinery expansion plans and retail marketing strategies are conditioned on such forecasts. Similarly, public policy decisions regarding auto efficiency standards, auto pollution controls, and oil import policy depend on gasoline demand forecasts. Current forecasts tend to be extremely pessimistic with respect to gasoline demand in the 1980s. Wharton Econometric Forecasting Associates predicts a 14.7 percent decline in motor-vehicle fuel demand over the decade of the 1980s; Exxon's Energy Outlook predicts a 15.6 percent decline over the decade. Is such pessimism warranted? Are there key assumptions, which if changed, could produce a substantially different picture? U.S. oil imports have dropped from a peak of 8.9 mbd (million barrels per day) in 1977 (6.2 mbd from OPEC countries) to 5 mbd in 1982. Simultaneously, U. S. demand for oil has dropped from 18.4 mbd to 16 mbd, and our dependency on imports has dropped from 43 percent to 37 percent. Unfortunately, the costs of energy imports continued to climb, from $8 billion in 1973 to $44 billion in 1977 to $81 billion in 1981 (Department of Energy [DOE], 1982). We are standing at a watershed in world development-the transition from an era of cheap and abundant energy to one where energy becomes scarcer and dearer. This paper discusses from the U.K. standpoint the opportunity that enhanced energy conservation presents to industry both to modernize and rethink its energy structures. Also,and of equal importance, is the response to the challenge of meeting the new investment demands that energy conservation presents.